The Orange Holiday Festival Committee works very hard to make the annual event fun for everyone. They can make up a schedule and cram a lot of activities into a very short period of time, but they can’t control the weather. Even with a steady drizzle putting a damper on things, Sunday’s annual event was far from a washout. Al deCant brought smiles and excitement to children’s faces at the library. New visitors appreciated the history lessons they learned at the Stone-Otis House and Academy Building. And who doesn’t love the new model railroad layout in the Academy basement? Over at the Congregational Church, the Bell Choir was magnificent as usual and guests were treated to something new, The Amity Chamber Singers performed in the balcony instead of at the traditional spot at the library. The OVNA building had a lot of wonderful gingerbread creations and the fireplace Ice Sculpture was really something else. The Case Memorial Library experienced less traffic this year due to two major changes. First, as previously mentioned, the absence of the Chamber Singers, and the “break” that the Friends of the Library took from their sponsored decorated tree display this year. Two features that were appreciated were deCant’s performance, Letters to Santa, and the “guess how many candies” contest (run by Kim Browe). Now, in its second year, the tractor parade drew the attention of the entire crowd, with more participants than last year. Led by Blue Fantarella, they slowly rolled up Orange Center Road, big tractors, little tractors, tractors pulling trailers, all beautifully decorated with lights, garland, inflatables, and lighted plastic blown figures. The Orange Volunteer Fire Department then announced Santa’s arrival with horns and sirens as they delivered the jolly old elf to the bright-eyed children who’d been anticipating the chance to meet him in person. Because of the rain, First Selectman Jim Zeoli sped things up a little this time so everyone wouldn’t have to spend any more time getting wet than necessary. A young boy, who’d been chosen came forward and flipped the switch with Buddy the Elf, and he was delighted. Santa took a seat in the trailer that he and his elves made up in the North Pole and welcomed all of the children to come in and share their Christmas wishes. 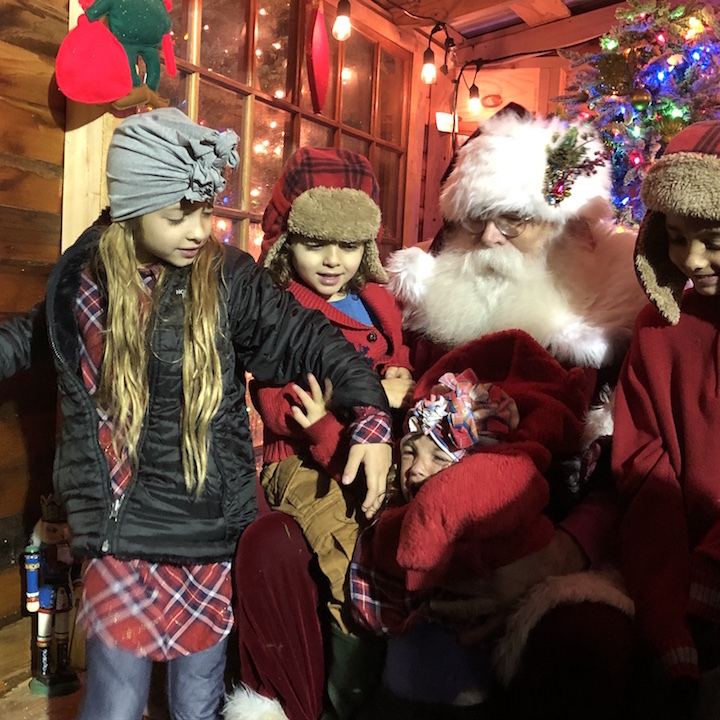 As expected, some little ones were apprehensive and wouldn’t come in without their mommy, but Santa is clever and found a way for nearly every parent to get a photo of their child with him. Even a puppy happily sat for a photo op. One of the most sincere exchanges was from a group of Amity Chamber Singers who documented their visit with a selfie video, as they asked Santa for acceptance letters to the college of their choice(s). Thank you to the Committee for their hard work and for pulling off another successful Holiday Festival — even if Mother Nature had other plans. The Stone-Otis House on Orange Center Road will be open by appointment for tours of its Victorian Christmas display. Visitors can return to the 19th century home when Christmas took on a completely different look than today. The display will continue until the end of March. For information call 203-795-3106 and leave a message. All calls will be returned. The New Light Switch was designed by Chris Small. The Town of Orange invites you to attend the Annual Holiday Festival and Tree Lighting on Sunday, December 6, 2015. 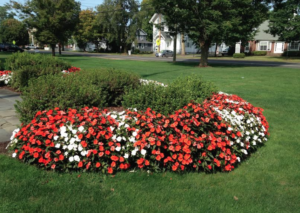 Festivities on and around the Orange Town Green will begin at 3:00 p.m. Visitors may tour the Stone-Otis House to learn what a Victorian Christmas was like. The Academy Building and the antique shop will be open and invites you to view the Historical Society’s antique collections and Emily Prudden Watercolors, as well as the New Haven to Derby line model railroad in the lower level from 3:00 – 5:00 p.m. The Orange Congregational Church Bell Choir will perform a hand bell concert and carol sing in the church sanctuary from 4:00 to 5:00 p.m. as well as an alternative giving opportunity for Heifer International, cookie sale and crafts for the kids from 3 – 5 p.m. The Case Memorial Library will be splendidly decorated, and will host a performance by Al deCant of Half Moon Music who will present a children’s musical program in the library meeting room from 3:30 – 4:00 p.m. and from the Amity Chamber Singers who will perform from 4:15 – 4:30 p.m. Guess who many candies in the jar at the library and win a prize, write a letter to Santa Claus and make a craft in the craft room. The Library will be open from 3:00 p.m. – 5:00 p.m. The Annual Gingerbread Contest will be featured in the Clark Building. Friends of all ages are invited to enter a gingerbread creation. Entries must be dropped off at the Clark Building from 2:00 – 3:00 p.m. on December 6th and must be picked up between 5:30 – 6:00 p.m. The winner will be invited to light the Christmas Tree. An ice carving demonstration will take place in front of the Clark Building from 3:00 – 5:00 p.m.
Santa Claus will arrive at 5:00 p.m. 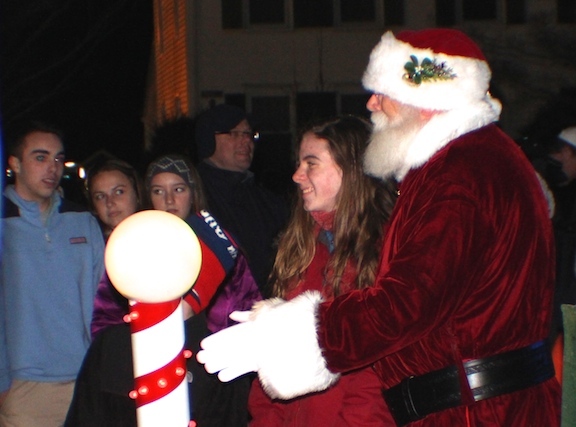 The Tree Lighting will take place at 5:30 p.m.
Children can visit with Santa on the Town Green. The Holiday Festival will end at 6:00 p.m. The Stone-Otis House herb garden. The Orange Historical Society Antique Shop Museum has grape jelly made from the grapes grown behind the historic Stone-Otis House. The vine is more than 175 years old and yielded more than 30 pounds of grapes this season. Come visit the museum at 605 Orange Center Road to pick up some jelly and other wonderful things for your holiday parties and hostess gifts. They also have home-grown Lovage, an herb not well-known here but used in the soup served at Woodbridge Tavern night. The Museum is open every Saturday from 10 a.m. to 3 p.m. For information call 203-795-3106.
the 3-day American Girl Doll camp held at the historic Stone-Otis House this week. Thirteen girls from various towns around Orange as far west as Seymour and south from Ridgefield attended a 3-day American Girl Doll Camp this week at the historic Stone-Otis House. The program was coordinated by Pat Lovelace from the Guilford Keeping Society in conjunction with the Orange Historical Society staff members Jan Clarke and Ginny Reinhard. During the three days, the girls read, wrote and created. They learned about their everyday lives by reading their stories, heard about when they lived, wrote in their own journals, made crafts, played games from the doll’s time period and sampled food from recipes they would have used. By the time camp ended on Wednesday, the girls already were talking about returning next year. As a special treat to the community the Stone-Otis House is open Saturday, Aug. 22 from 11-2. The Stone-Otis House, 615 Orange Center Road, Orange will be open for tours on Saturday, August 22 from 11 a.m. – 2 p.m. This 1830 house represents one of the finest old homes in what was the newly formed town of Orange. Built on the east side of the Town Green, this modified Greek Revival stands as a tribute to the fine workmanship of the time. The home has had two owners and it reflects both families with artifacts, furniture, photographs and toys from the 19th century. Admission is $3.00 for adults and children under 12 are free. The Orange Historical Society will present a Summer Historical American Girl Doll Camp for ages 7-12 at the Stone-Otis House, 615 Orange Center Road, August 17, 18 and 19 from 9:30-12:00. Come join with Historical American Girls as they travel through American history. lived, write in your own journal, make crafts, play games from the doll’s time period and sample food from recipes they would have used. Cost: $60 (includes project materials) Bring your own American Girl Doll. Limited to 10 girls so make your reservations early by sending a check to Orange Historical Society, PO Box 784, Orange CT 06477. I am needing to reach out to you because for 3 years, the Stone-Otis House has needed painting but the job that was scheduled was cancelled because Paul Foley, a competent restoration carpenter, told me and our First Selectman that there is a leak in the northeast corner which is making the wall damp and popping the paint. This has caused the ceiling in the bedroom and bathroom downstairs damage with its paint peeling. Although the house has not been open to the public in the summer for two years, that fact is irrelevant because the house needs to be saved and not neglected by the town that owns it. The Orange Historical Society did receive a grant for the painting 2 years ago, a grant which we did not have to apply for but did for the sake of the building and to save the town money but we had to decline it because of the extensive repairs that Paul Foley identified. We at the historical society have committed 15 years to the Bryan-Andrew house, as promised and all our funding efforts except the paint for the Stone-Otis House have been in that house. Even though the town owns it as well, we made the promise to restore it and that we have done and are still doing! I would like to ask that you contact our First Selectman about finding funding to repair this 1830 house as I don’t see that this is being thought about, in fact, I feel that it is being neglected with forethought. This is It! Today Is The Annual Holiday Festival Beginning at 3 p.m.
Around Town, Home, Latest News Comments Off on This is It! Today Is The Annual Holiday Festival Beginning at 3 p.m.
You asked for it, now here it is, everything you need to know about the Holiday Festival. The Town of Orange invites you to attend the Annual Holiday Festival and Tree Lighting on Sunday, December 7, 2014. Festivities on and around the Orange Town Green will begin at 3:00 p.m. Visitors may tour the Stone-Otis House to learn what a Victorian Christmas was like. The Connecticut Yuletide Carolers will provide musical entertainment strolling around town buildings and at the Stone-Otis House from 3:45 p.m. to 5:15 p.m. The Academy Building and the antique shop will be open and invites you to view the Historical Society’s antique collections and Emily Prudden Watercolors. The Orange-Derby model Railroad will not be participating this year as they are rebuilding their display. The Orange Juniorettes will have its First Annual Wonderland Waggin’ Pet Food Drive to benefit the Milford/Orange Animal Shelter. We will accept donations at the decorated wagon located on the front lawn of Mapleview Farm throughout the Tree Lighting ceremonies. The shelter is in need of pet food (wet or dry), litter, treats, toys, and pet beds. The Case Memorial Library will be splendidly decorated, and will host a performance from the Amity Chamber Singers from 3:45 p.m. – 4:00 p.m. and from Al deCant who will perform a children’s musical program in the library meeting room from 4:00 p.m. – 4:30 p.m. Guess how many candies in the jar at the library and win a prize, write a letter to Santa Claus and make a craft in the craft room. The Library will be open from 3:00 p.m. – 5:00 p.m. The Annual Gingerbread Contest will be featured in the Clark Building. Friends of all ages are invited to enter a gingerbread creation. Entries must be dropped off at the Clark Building from 2:00 – 3:00 p.m. on Dec. 7 and must be picked up between 5:30 – 6:00 p.m.
Watch a gingerbread house making demonstration by Julia’s Bakery and Chef’s Emporium from 3:30 – 4:30 p.m. The Gingerbread House Contest will be judged by Julia’s Bakery and Chef’s Emporium and the winner will be invited to light the Christmas Tree. Crafters will be available near the Clark Building. Santa Claus will arrive at 5:00 p.m. The Tree Lighting will take place at 5:30 p.m. Children can visit with Santa on the Town Green. The Holiday Festival will end at 6:00 p.m.